The NS-10MT model has a bass reflex system, an increased maximum input (180W vs 120W for 1987 versions, and vs 50W for the 1978 original), magnetically sealed drivers (like the NS-10MX), a slightly larger box to accomodate mounting brackets, and no distinguishing model name on the face – just “YAMAHA” written bottom center. Also, the connectors for the front cover poke out, instead of in. It is the last of the NS10 family, and the most radically different in design, although still very noticable for the white cone. 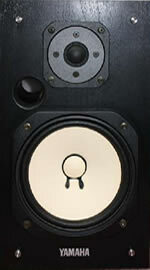 It is also the only NS-10M speaker sold individually, and thus does not come in matching pairs. The bass reflex port is a hole which allows sound from the back of the low driver to escape the box. All previous NS-10M versions had been housed in a sealed box. Bass reflex ports can sometimes muddy a speaker’s performance, because the air is escaping the box instead of rebounding and quickly pushing the woofer back into place. However with the NS10’s extremely light weight paper cone, Yamaha discovered that this was not such an issue. The bass reflex subsequently extended the frequency response of the NS-10MT down to 43Hz (the 1987 NS-10M versions were 60Hz, and original in 1978 was 85Hz). The extended bass on the NS-10MT gave the speaker some freedom as to positioning and mounting. Whereas the previous versions benefited from “bookshelf” style placement (on a large desktop or near a wall), the NS-10MT was free to roam. This made it useful for home theaters, as well as studios without the resources for sub-woofers or far-field monitors. 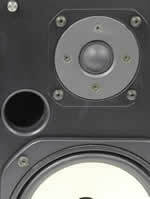 NS-10MT has the distinctive bass reflex port (hole) and centered tweeter with no grill. It also has no distinguishing name on the front, and the cover connectors poke out instead of in.